Some sketches from a story I’m working on. Happy Friday! For those who hate an itchy sweater–a character study I drew a while ago–a perfect fit for this week’s Illustration Friday! (click to enlarge). Three cheers for all the Little Free Libraries I pass everyday when I walk my pup! Sully went to the groomer yesterday, so I was able to grab quick pics on my way home without having to manage my squirrel-crazy dog. The Little Free Library movement (“take and book, leave a book”) was started in 2010 by Todd Bol of Hudson, Wisconsin and Rick Brooks of UW-Madison, with the goal of building 2,510 Little Free Libraries—as many as Andrew Carnegie. By January of 2016, the number exceeds 36,000. Their mission: “To promote literacy and the love of reading by building free book exchanges worldwide and to build a sense of community as we share skills, creativity and wisdom across generations.” Gotta love that! 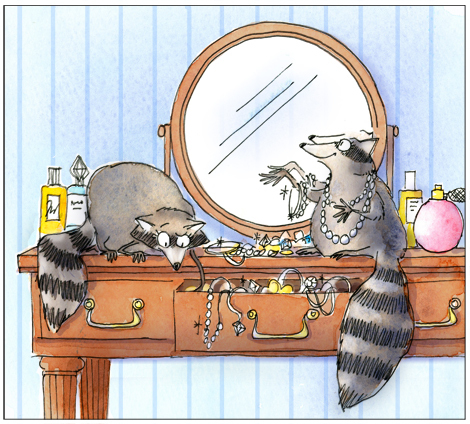 November is Picture Book Idea Month, better known as PiBoIdMo, created and sponsored by author Tara Lazar. The challenge is to create 30 picture book concepts in 30 days. If you are interested, registration is still open through November 7th—it is fun and best of all, FREE! 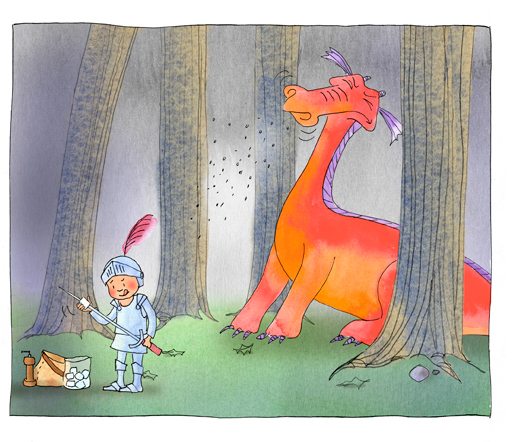 Plus there are daily blog posts from guest authors and illustrators for inspiration. Although my daily assignment has moved from pictures (Inktober) to words (PiBoIdMo), I hope to include an ink doodle with every picture book idea. For me, the key is not to worry about how fantastic the idea is—just get it down on paper. Kinda like planting seeds—some fizzle out, some grown into bigger ideas. It’s a great exercise, and it works for me—I have a submission-ready manuscript from a quick idea I originally jotted down in my 2013 PiBoIdMo notebook. Here’s the start of my 2014 journal. 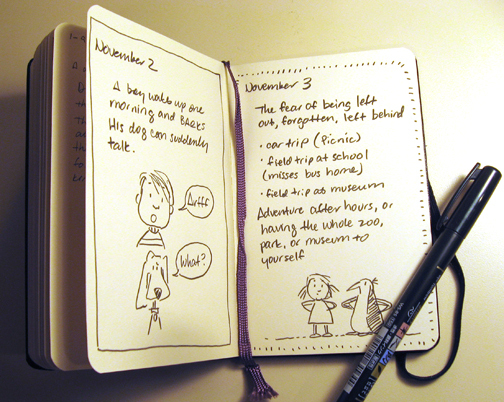 I use a tiny Moleskin (3.5 x 5.5)—the book format forces a commitment; the size keeps it from being too intimidating! 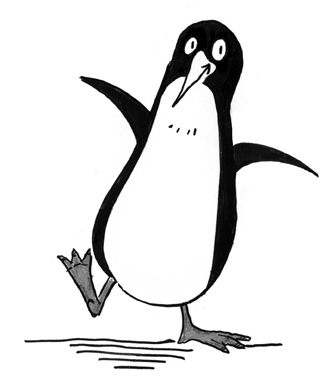 I love penguins and can’t believe I left them out of Inktober so here’s one with “smooth moves” for Illustration Friday. Thank you for all the support and nice comments throughout Inktober. I missed a day here and there, but really enjoyed it and so appreciate Jake Parker for creating the event. Sketching in ink is a fun challenge—each pen stroke is a commitment, but it also loosens you up a bit. I’ve been using Pigma Micron pens for a zillion years, but during Inktober I finally found a brush pen that I like. 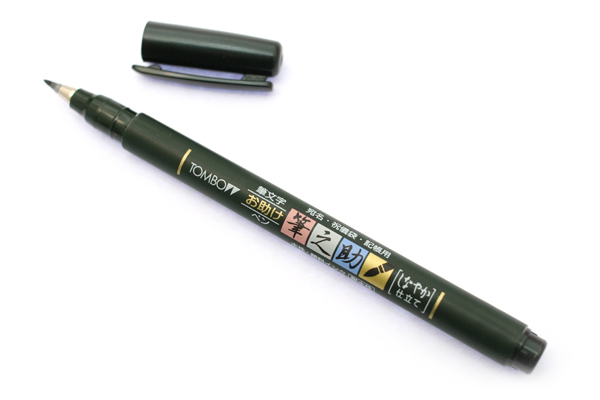 I’m a klutz with the broader-tipped and / or soft brush pens, but Jet Pens carries a large selection of Japanese calligraphy pens. 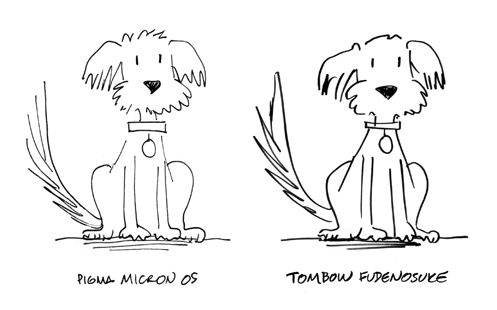 I like one called Tombow Fudenosuke; the brush tip is not too soft and provides a subtler line variation, especially for small sketches. Inky-black, waterproof, doesn’t smear (I’m left-handed so that’s a big plus for me). 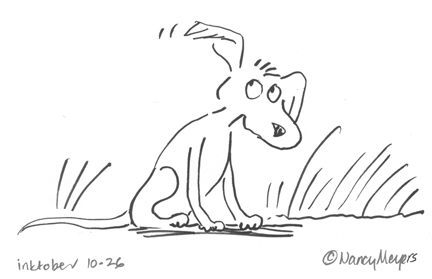 Same pup from Friday–from a manuscript I’m working on. I need a name for him, so let me know if you have any suggestions! Last Friday night, our neighbors Julie and Bruce closed off our block, set up card tables and tents, blew up a jumpy-trampoline-thing, and even hired a local band–all to celebrate (belatedly) Harrison’s sixth birthday and his last day of treatment for acute lymphoblastic leukemia. The party was Julie and Bruce’s way of thanking all the people who have supported their family on this very hard journey. It was a lovely evening full of amazing energy; the moment was indeed golden. I created this series of illustrations several months ago, as a gift for Harrison when he finished his treatment. 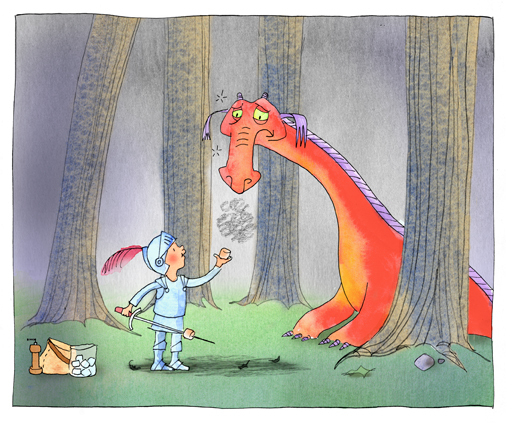 May we all face life’s dragons as courageously as he has. Rock on, Harrison!!!! Once upon a time in a forest not so far away, a young knight was on his way to the castle. 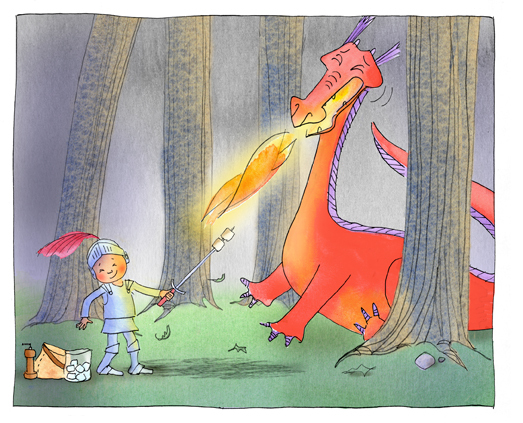 The princess was having a barbecue and he was bringing her favorite treat, marshmallows for toasting. The rest of the story is best told in pictures. . . .
New England SCBWI conference in May–please check out her blog at: thedailymermaid.blogspot.com. 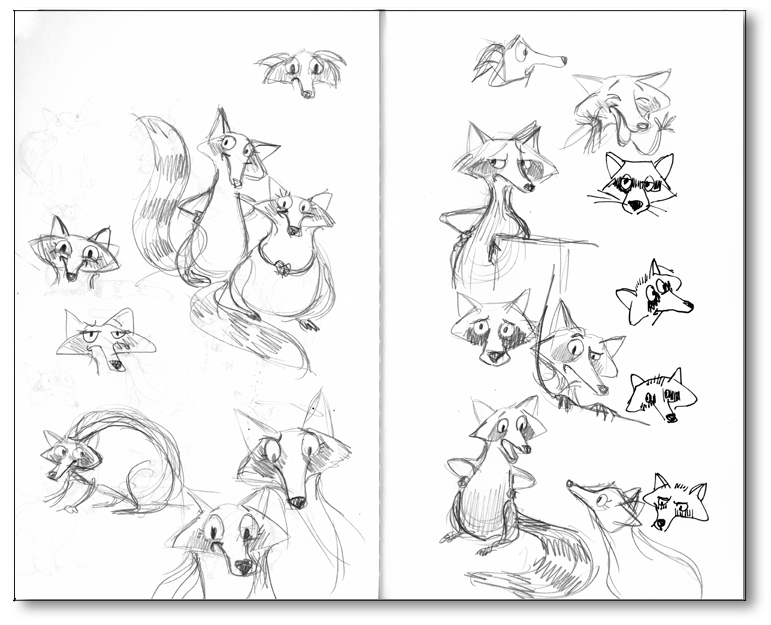 So I’ve been busy working on a set of early readers featuring these little ladies. 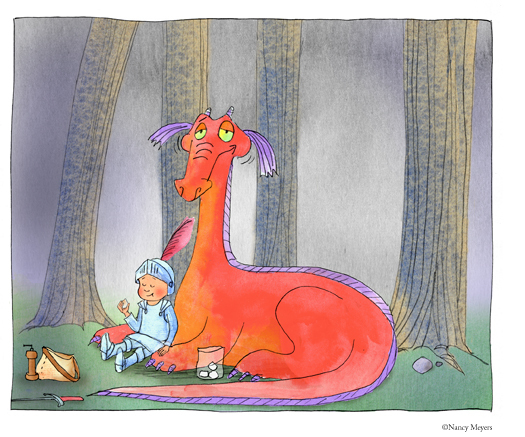 I also have a couple picture book manuscripts in different stages of rewrites. I guess I’m not very trendy; I like subtle humor and I think kids appreciate it, too. When drawing, I strive to keep my linework simple, fresh and expressive. As best I can, I try to do the same with my writing. My heroes are William Steig and Arnold Lobel. Many moons ago, I wrote a daily cartoon strip in college–it was my first experience with developing story and art at the same time, and the characters became very real to me–I truly missed them when the strip ended. 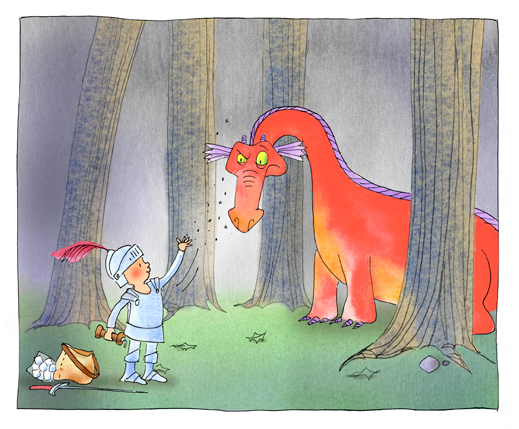 I still find a story in every illustration I create, and each character always seems to have something to say. The hard part is determining the best way to bring the words and images together. 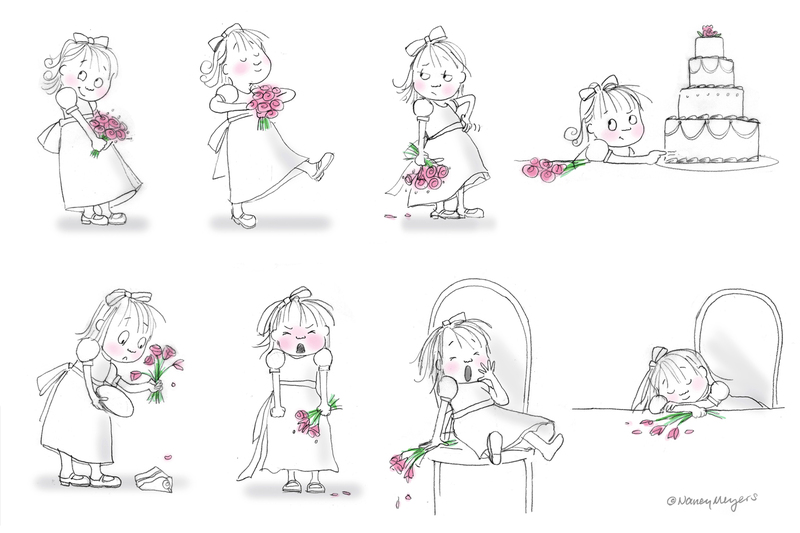 As an illustrator, my stories often develop as I’m drawing. But once I get past a first draft, I find it best to put the images away so I can really concentrate on the nuances of language. It’s a tricky tango. I’ve used Mentors for Rent and SCBWI conferences for manuscript critiques, and I often refer to Cheryl Klein’s Second Sight. When I hit a roadblock, I study books I like and retype their manuscripts to analyze the pacing, cadence, and story arc. For early readers, I’ve been reading a lot, using a list of Geisel Award winners as a place to start. I have to schedule time to write (early morning or very late at night works best for me), otherwise all the time goes to illustration deadlines, marketing, and business stuff. I find writing more challenging than illustrating, so when I’m really stuck I just go back to drawing. I guess that’s what they mean by the creative cycle! Marty Kelley is a children’s author and illustrator but has, in the past, been a second grade teacher, a baker, a cartoonist, a newspaper art director, a drummer in a heavy metal band, a balloon delivery guy, an animator, and lots of other things. He has written and illustrated eight of his own published children’s books as well as having illustrated several books for other authors. Books he has both written and illustrated are: Fall Is Not Easy; The Rules; Winter Woes; Summer Stinks; Spring Goes Squish; The Messiest Desk; Twelve Terrible Things; and Fame, Fortune, and the Bran Muffins of Doom. You can read about his writing process on his blog, martykelley.blogspot.com. Anneliese Juergensen is a children’s book illustrator and author who loves animals (especially whales! ), terrible puns, traveling to new places, museums and bookstores, and avocado. You can see her blog and more of her artwork at AnnelieseJuergensen.com. What I’ve been working on. . . .